A bill is proposed legislation under consideration by a legislature. A bill does not become law until it is passed by the legislature and, in most cases, approved by the executive. Once a bill has been enacted into law, it is called an Act or a statute. The term bill is primarily used in the United States and the Commonwealth. In the United Kingdom, the subparts of a bill are known as clauses while the subparts of an Act are known as sections. The preparation of a bill may involve the production of a draft bill prior to the introduction of the bill into the legislature. In the United Kingdom, draft Bills are frequently considered to be confidential. 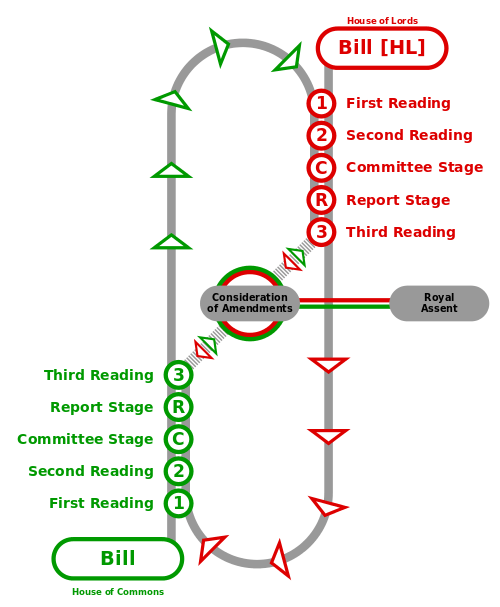 In the British/Westminster system, where the executive is drawn from the legislature and usually holds a majority in the lower house, most bills are introduced by the executive (government bill). In principle, the legislature meets to consider the demands of the executive, as set out in the Queen's Speech or Speech from the Throne. Where a piece of primary legislation is termed an act, the process of a bill becoming law may be termed enactment. Once a bill is passed by the legislature, it may automatically become law, or it may need need further approval, in which case enactment may be effected by the approver's signature or proclamation. Bills passed by the legislature usually require the approval of the executive such as the monarch, president, or governor to become law. An exception was the Irish Free State from the abolition of the Governor-General in December 1936 to the creation of the office of President in December 1937, during which period bills approved by the Oireachtas became law immediately. In parliamentary systems, approval is normally a formality, since the ceremonial head is directed by an executive controlled by the legislature. In constitutional monarchies, this approval is called royal assent. In rare cases approval may be refused or "reserved" by the ceremonial head's use of a reserve power. The legislature may have significantly less power to introduce bills on such issues and may require the approval beforehand. In Commonwealth realms the royal prerogative informs this. In the United Kingdom, for example, cases include payments to the royal family, succession to the throne, and the monarch's exercise of prerogative powers. ↑ - Education 2020: Government course; topic House of Representatives (USA), definition of bill: "A proposed law presented to a legislative body for consideration." ↑ Hilaire Barnett. Constitutional and Administrative Law. Second Edition. Cavendish. 1998. Page 537. ↑ Bradley and Ewing. Constitutional and Administrative Law. Twelfth Edition. Longman. 1997. Page 718. ↑ "GovTrack: Search Legislation in Congress". GovTrack.us. Retrieved 2009-03-30. ↑ "Coroners and Justice Bill 2008–09". ↑ "Coroners and Justice Act 2009" (PDF). Office of Public Sector Information. 12 November 2009. Archived (PDF) from the original on 31 March 2010. Retrieved 2010-03-23.